Fat Tuesday: Poutine Three Ways! Oh, Canada! Thank you for the poutine! I’ve been talking about poutine with my oldest for a while now and I finally kept my word and made it for dinner. 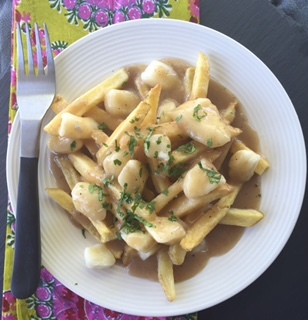 I wanted to do a traditional poutine recipe as well as a few twists. So, you are getting a three way! Eeerrrr… I mean three WAYS. 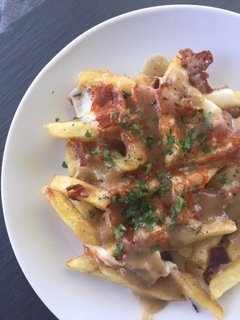 For those of you who don’t know, poutine is a wonderful concoction of french fries, cheese and gravy… Uuuummm, sign me up! Yeah, we threw on some parsley for color, but let’s be real… It’s all about that gravy, that gravy, don’t dribble! 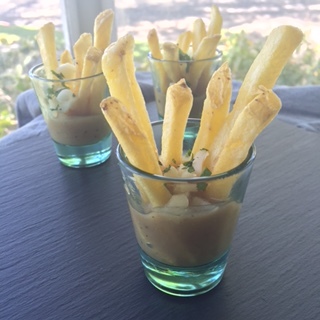 I used french fries from the freezer section, but feel free to make your own if you’ve got the time! Time… oh man, that ever elusive thing I’m always chasing! Let’s address it, shall we? Some people may read my blog and think I’m a big ol’ cheater! Boxed cake mixes on occasion, canned chilies and the like… These things are not cheating, wanna know why? Because there aren’t any rules for doing life, yo! I’m a swearing mother of two, I work a full time job, which by the way includes and hour and a half commute each day, and I have this pesky little thing called a LIFE. So, spare me your judgement and move along little hater! The people who “would never”, probably don’t anyway so, they are in no position to judge you! You gotta do what you’ve gotta do and the fact that you’re actually doing it, is a beautiful thing! Now back to my three way. White cheddar cheese curds. These are available at Trader Joes and Whole Foods. I used to buy them from the “cheese lady” at the farmer’s market back home. A decent substitute would be torn pieces of mozzarella. Dissolve cornstarch in water and set aside. 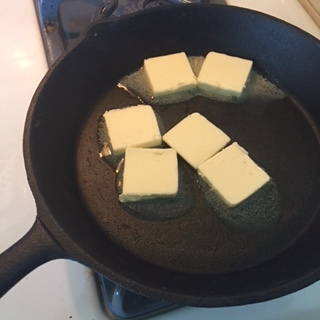 In a large sauce pan or deep cast iron skillet melt butter, add flour and cook over medium high heat stirring regularly, until it turns golden brown. Add garlic and cook an additional minute. Next, add broth and bring to a boil. Whisk in cornstarch and allow to simmer for 5 minutes or until it begins to thicken. Salt and pepper to taste. 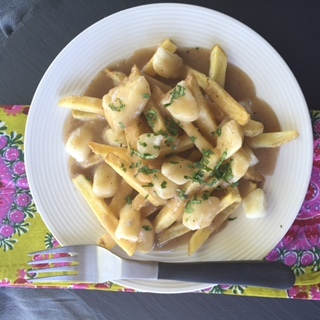 To assemble the poutine, use a deep plate or a shallow bowl, arrange a neat pile of fries. I kept my pile kind of shallow in order to have maximum gravy exposure, but you do what you like. Next, add the cheese curds, as many or as few as you like! 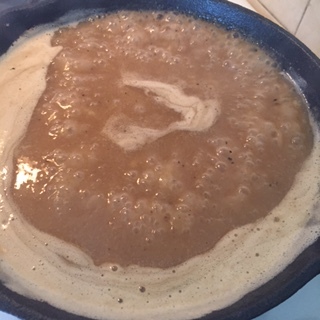 Now it’s time to add the gravy! 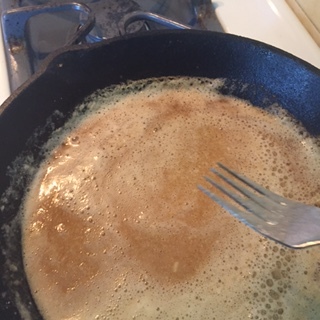 Ladle the gravy on while it’s hot. It will heat the cheese and it will all begin to meld together in a gooey pile of goodness! Don’t forget the color! Sprinkle on a few pinches of chopped parsley and voila! Next, I decided to make an appetizer version of this dish. Finger food? The hell you say! I lined up some shot glasses and put 6 or so fries in each standing upright. 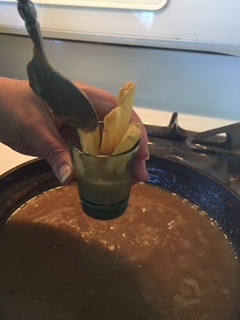 Next, I spooned on some gravy, sprinkled cheese and parsley and had some adorable poutine shooters! 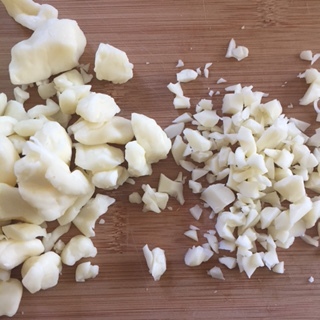 I gave my cheese curds a rough chop for this application for better melting. The last of the three was just for fun, but I have to admit, it was my favorite! 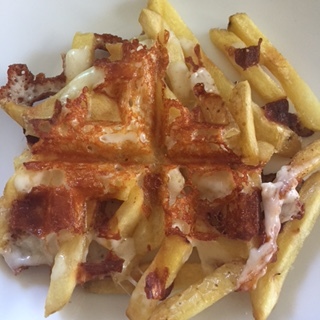 I arranged a pile of fries onto my waffle iron and topped them generously with the cheese curds. I closed that baby up and let it sizzle! Ho. Lee. Crap! The cheese got all crispy and golden and it acted as a binder for the fries. I then removed the cheesy french fried waffle with tongs. Once it was plated, I topped it with gravy and parsley and grabbed a fork! SO good! A little disclaimer, here… I just got a new waffle iron. You will be seeing many more waffled things in the weeks to come! I hope you enjoy this as much as we did! Bon Appetit! Previous Post The Quaffle. Or is it the Frittaffle? Next Post An over the top birthday cake, for an over the top friend… The Lavender Honey Lemon Meringue Cake.